I can't believe my blog is already a year old :) a year ago today I start to write on this blog,as a way to document my recipes. Then after I discovered foodbuzz via google,I thought It was cool and fun to share foods pictures and recipes or any food related, with other foodies. Since then I found so many different foods and recipes from foodbuzz member,so thank you guys for sharing and cheers !! pour rose wine,club soda,mango juice and chambord,stir and chill for 12-24 hours. Congrats on your first year of blogging and hoping to see more wonderful recipes. 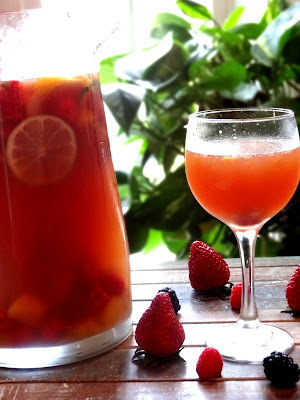 Love this sangria and will make a perfect drink for me to relax during the weekend. This does look like a pretty delicious way to celebrate your 1 year mark. Funny what a blog can blossom into when you compare it to your original basis for it! Cheers to you and enjoy the weekend! Happy blogoversary. This Sangria sounds delish, love all the fruit in there, especially the mango. Cheers!! Congratulations!! One year goes by so fast especially when you can share it with others. This sangria makes a great party drink! Hope you drink it with some good friends. Wow, that sangria has an absolutely gorgeous color. Congratulations on your blogiversary! Happy 1 year anniversary my friend. So happy to have met you through foodbuzz. This drink is the perfect way to celebrate. Happy Blogeversary, Ridwan! This sangria looks just perfect! Here's to another great year!